It’s no secret that La La Land reignited Hollywood’s appetite for a modern musical, and that’s despite the fact that Damien Chazelle’s dreamy love story was piped at the post by Moonlight in spectacular fashion during February’s Oscar ceremony. Perhaps more than anything else, La La Land stands as living proof that a modern-day musical is not only economically feasible, but it also has the chance to become a critical and commercial hit – in the right hands, of course – and one director stepping up to the plate later this year is Michael Gracey. His movie? The Greatest Showman, an original drama set to chronicle the remarkable rags-to-riches story of P.T. Barnum, who is often credited as the founding father of show business. Trading mutants for musicals is Logan actor Hugh Jackman, who calls upon his Les Misérables experience in today’s first-look trailer. Baywatch actor Zac Efron stars opposite Jackman as Barnum’s loyal assistant, while Spider-Man: Homecoming‘s Zendaya can be seen as a talented trapeze artist. Michelle Williams, meanwhile, co-stars as Barnum’s wife, Charity. And make no mistake, the inspirations of La La Land run deep in The Greatest Showman, as Fox’s potentially Oscar-worthy romp will feature original music composed by La La Land and Dear Evan Hanson duo Benj Pasek and Justin Paul. Jenny Bicks and Bill Condon, on the other hand, are the brains behind the screenplay, and it’ll be fascinating to watch how audiences react to an old-timey musical. “The Greatest Showman” is a bold and original musical that celebrates the birth of show business and the sense of wonder we feel when dreams come to life. Inspired by the ambition and imagination of P.T. Barnum, “The Greatest Showman” tells the story of a visionary who rose from nothing to create a mesmerizing spectacle that became a worldwide sensation. “The Greatest Showman” is directed by exciting new filmmaker, Michael Gracey, with songs by Academy Award winners Benj Pasek and Justin Paul. 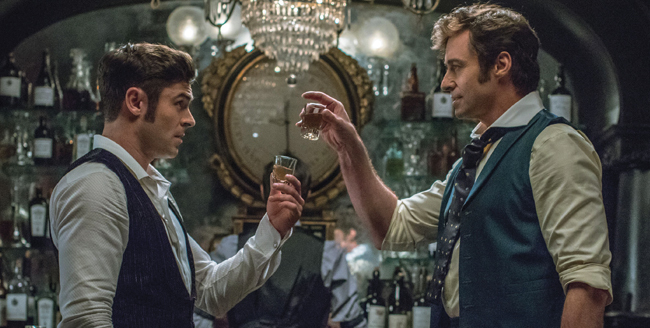 The Greatest Showman will sing and dance its way into theatres in time for December 25th, when 20th Century Fox’s high-profile musical will open opposite The Current War and Universal sequel Pitch Perfect 3.